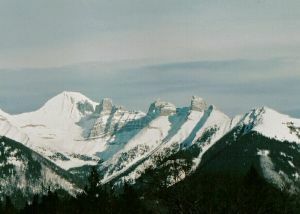 This peak is #10 in Prominence List for Alberta .Located SSE of Mount Inglismaldie. Name Notes: Named in 1904 after Colonel Sir Eduard Percy Girouard who built railways in N and S Africa during colonial times as the British Empire grew. After that he went on to become a colonial administrator and in 1915 The Director General of Munitions Supply.